In a county of 500,000, the chamber has been an active, valued participant in the community, but they have been operating on autopilot. With a member retention rate of 70%, and events feeling more revenue-driven than member-focused, this chamber has undeniable room to improve. All the committees (like Audit and Investment) were focused inward (internally), directing their efforts to chamber operations. Their Chamber’s mission statement was 50 words long and 15 years old. Most board members struggled to articulate the purpose for the chamber’s existence. Goals had been set long ago. They were ambiguous, non-descript and hard to follow. No wonder the board never referenced the mission and goals. It had been ages since their board had a strategic planning meeting. This scenario is far too common for chambers and other non-profits. Board members and staff alike push back at the suggestion of a retreat. Because your mission is the legal declaration that justifies your non-profit existence. Your goals are commitments … by your board … for your members. Together, they define your purpose and motivate your leaders. An ignored mission statement makes board decisions arbitrary or whimsical. An applied mission statement guides a board’s discussions and focuses their decisions. Strategic planning meetings should be scheduled every 3-5 years, or they may feel more intrusive than helpful. Even when the need for a strategic plan is clear, organizations struggle to find days, or even a day for the board members to meet to focus on the non-profit’s mission and goals. In this case, the chamber wanted a new strategic plan. They wanted to clarify the mission, establish goals and agree in clear, action items. They wanted a retreat. They felt they only could get a quorum if they scheduled the meeting for just four hours. The chamber president asked, “How much time will it take? My board says they don’t have time and wonder why it takes a day? From experience, I said we can do it in four hours. 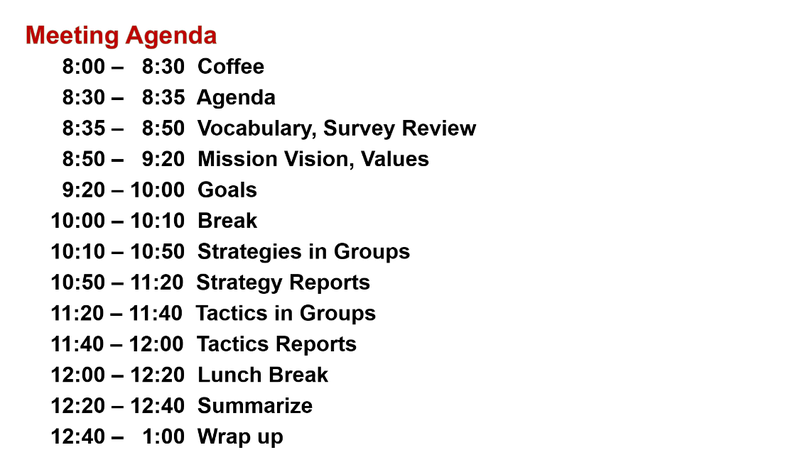 How do you get a strategic plan from a half day retreat?” It can be done. Some have misconceptions that their meeting will consist of unproductive discussions with an emphasis on, “Tell us how you feel …” If this is the case with a board, there may be another option. The half-day retreat is becoming increasingly popular. They require a very focused process. They can get measurable results. These meetings can also generate excitement and engagement. Everyone can feel heard. Time can be used efficiently and effectively. An organization can get the outcomes it needs. Remember paint-by-number? It was an outline of a picture. The artist colored it in. A well-structured retreat is an outline for future progress. Provide them the outline. They paint it. Collect responses, then email the results in advance. Make time in the agenda to review the results. Don’t get stuck on semantics. It’s easier to stay on topic when the focus is in big font on the wall. Re-write the mission statement in real time on the screen, it’s exciting. Consider an assistant to keep the action moving. Facilitators get responses to get results. Assistants can take notes and write on flip charts. Someone even volunteered to be the strategic plan champion. The board members left with clarity about their roles. Some even laughed at how much had been accomplished. They were engaged and empowered. Planning a strategic planning meeting … it can improve a chamber’s future. Of course after the retreat adjourns, there will be more work to regarding implementation. The staff will want to create a timeline and assignments, committees will want to be engaged, and members should be informed of the priorities set by the leadership. Bill Graham, delivers communication training and speeches. He is president of Graham Corporate Communications Inc. For information, bill@grahamcc.com, 917-705-0663 or www.GrahamCC.com.